In 1974, Robert DiNiro took a role that once belonged to Marlon Brando, and completely made it his own, performing the entire role in Italian, no less. In that same film, Al Pacino furthered his deep, frightening portrayal of Michael Corleone, and cemented the performance into acting history. The Godfather Part II made them legends, but they had no scenes together. In 1995, they were reunited for Michael Mann’s Heat; their first scene together came late in the film, but that scene became infamous. Still, people have been waiting a long time to see these two acting legends spend some serious screen time together. 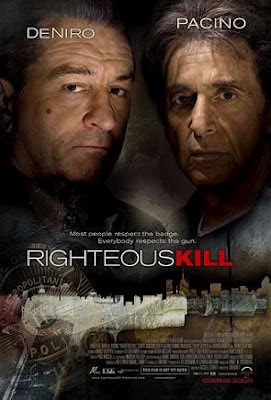 With that in mind, Righteous Kill, which stars the two as cops who have been partners for 30 years, should be terrific. Right? But sadly, it isn’t. Far from it. Kill isn’t just mediocre; it’s silly, and mildly pathetic. It’s a thriller with a plot that probably wouldn’t be worthy of CSI, paper-thin characters, and camera work that too often resorts to extreme close-ups. Plus, this is one of those thrillers that relies entirely on the twist. In the opening moments, it establishes who the killer is, and leads you to believe that for the entirety of the movie, until it’s time for the big twist. But this twist isn’t good. It’s not shocking, either because you can figure it out after watching for twenty minutes, or because it’s not presented in a satisfyingly dramatic way. Yes, it’s cool to see DiNiro and Pacino together, and their chemistry is palpable, but good actors can only take bad writing so far. Sadly, apart from some clever dialogue, this is a very poorly written movie. The screenplay never bothers to add dimensions to these characters, and the lack of background information and development makes the characters uninteresting to watch. The screenplay, mixed with an iffy editing job, removes any narrative meditation, leaving just the bare bones and sinews of the plot. No major character moments, and no time to think about the barely explained plot points. This is a tiring way to pace a film, and to sit through it for 90 minutes only to get an obvious twist ending makes for a below average thriller. Jon Avnet’s direction is lazy and uninteresting, and as mentioned above, contains too many close ups, especially for a film shot in 2.35:1. But for everything wrong with the film, I can’t completely condemn it. I was entertained, but I was distracted by how much better this film could have, and should have been. That’s what it comes down; this movie should have been great. This is Robert DiNiro and Al Pacino on screen together; no matter what I heard, I had to see this movie, and was disappointed. The film The Forbidden Kingdom from April united Jackie Chan and Jet Li, another legendary match-up. It wasn’t a great film, but at least we had an epic fight between the two legends. Kill doesn’t completely utilize the talent, and treats them to a poor script and lazy direction. Perhaps one day DiNiro and Pacino will co-star in a film worthy of their legacy, but Kill certainly isn’t that film.